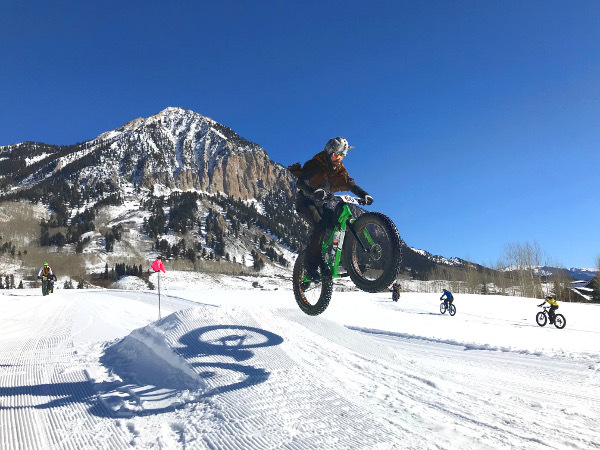 Fourth Annual Borealis Fat Bike World Championships Presented by Upslope Brewing Co.
We’re pleased to be hosting the fourth annual Fat Bike World Championships in Crested Butte and the Gunnison Valley this year January 23-27, 2019. Borealis Fat Bikes is returning as the title partner and Upslope Brewing Company will be joining as our presenting partner this year as well. Years 1-3 of the event were marked by fun, talent, and some pretty serious carnage. Enough carnage, in fact, to earn a feature in the Warren Miller film, Here, There, and Everywhere. Year 4 promises to be still bigger and better. While the World Championships race draws its fair share of true athletes and intense competitors, for most racers, it’s all about the fun. Costumes are welcome and encouraged. Beer will be flowing. Buns (both human and bread) will be branded. After parties will go off every night at different locations around Mt. Crested Butte and Crested Butte. Note: this is not an official UCI-sanctioned event. No points, no drug screenings, and winner takes all!